Armstrong’s rubber is rubber which is not sought after by table tennis player. Personally, I think that the Attack M and Attack L are the two rubbers that some players will be using. Even if you don’t know Armstrong’s rubber, you won’t lose anything as there are many other great rubbers available on the market that you can have. I haven’t seen a lot of Armstrong rubber advertised in the United States, but one of my good friends swears by the Armstrong Attack 8. She’s a chopper type player, called a “cut man” in Japanese, and likes the way this particular rubber handles the ball. She has been out of competitive table tennis for a while but has decided to start playing again. Does the Color of Table Tennis Rubber Affect Its Properties? She is planning on using the Armstrong Attack 8 with Tackifire that I reviewed before. The type M shown here has the 1.2mm pips. There is also an L version with slightly longer pips. I’ve always like Armstrong rubbers so here’s hoping they catch on a little more in the US! For the brand of Armstrong, some people find that everything can be at the highest level. My friend is placing this rubber and play with her backhand. The backhand is mainly used to block and chop the ball. Sometime she will do a powerful topspin by shifting to forehand playing stroke. She found that sometimes she has a problem with to receive the ball in low bounce with the chop to make it just over the net to the opponent’s side. So she has changed to a softer carbon blade, which is Stiga Offensive Classic Carbon. This seems like a good choice for her as she can now get good control of the ball. I have tried to play the game with the Armstrong Attack 8 Type M rubber by borrowing the racket from my friend. After a few strokes, I found that the trajectory that the blade generated is quite flat, it won’t make a great arc from your shot. The hitting pace is just nice and you do not need too much strength to hit the ball. By having this rubber on your blade, you can actually play a quite safe pushing. When you do the pushing, you can even notice that there are some spin reversals happened. The trajectory is flat, it won’t make a great arc from your shot. The hitting pace is just nice. This is a question I also had when I started looking for the kind of table tennis rubber that would be best for me. I wondered if choosing which rubber to order in red and which rubber to order in black would have any effect on play. The answer, according to Butterfly Japan’s FAQ is that there is no difference between the black and red rubbers. When tested in the factory they all produce the same results. However, players in Japan often say they feel that black table tennis rubber provide more speed than the same model in red. To sum up, the official word is that there is no difference between black and red table tennis rubbers, although some players say they feel and affect the ball differently. This rubber is designed for players to play fast attack close to the table. This is the special pimple-out rubber sheets manufactured by Armstrong. Once you get hold of this rubber, the first thing that you will notice is the pimples are slightly longer than ordinary short pimples. By having this rubber on your blade, you can play a very safe loop and drive. You can get a very good pace and good control over the ball with this rubber. It is harmless to provide you a good covering on the backhand. 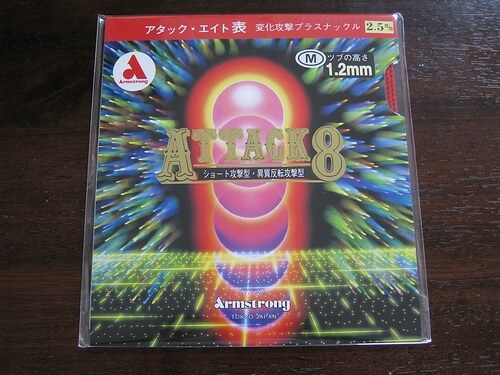 The Armstrong 8 Attack Type L with 1.8mm sponge is really good at blocking and counter-attacking. You can try to place this rubber on a slow blade. When you play with it you will find a very soft touch on it. If you play with this rubber, you can play a very safe game and the rubber can fits very well for you to perform your defending stroke. It can give you very good control over the ball especially when you are playing close to the table. If you are playing defense in the mid-distance, you can perform an attack anytime when you seek a chance. You can also play sidespin with your backhand, this rubber can give you a very good spin. The pip of Armstrong Attack L is small, thin, straight, and indeed sticky. It is very good for pushing the ball, but with poor speed and control. The rubber sponge is very soft but it doesn’t play well. You will feel the ball is like very heavy. These are the 2 types of rubbers that I have tried. Today I just brief you all on the feeling of using them and I hope this can help the players who use these rubbers. The reason I am not writing them in very detailed is that the blades used by all players are different, so the feeling of the sponge will be different. However, the basic performance will be the same. Another reason is that the technical movements of different players will have different feelings on the rubber. The third reason is that I have some description of the rubber, so you can have a basic understanding of the performance of the rubber by the height, density and size of the rubber pip! In fact, whether the rubber is easy to use or not, you must try it yourself. And don’t just understand it without actual play with it. For the Japanese Armstrong’s ATTACK rubber, I think it is more to pimples out. But it can give you more dwell time than other short pimples rubbers and also give you better spin. But I don’t recommend using them. I think the biggest advantages of Japanese rubber are its sponge. They are very soft, very elastic, good strength, good control, and feel very good.